Once upon a time, my countryside trips would be limited to exploring whatever was a stone’s throw away from the hotel. 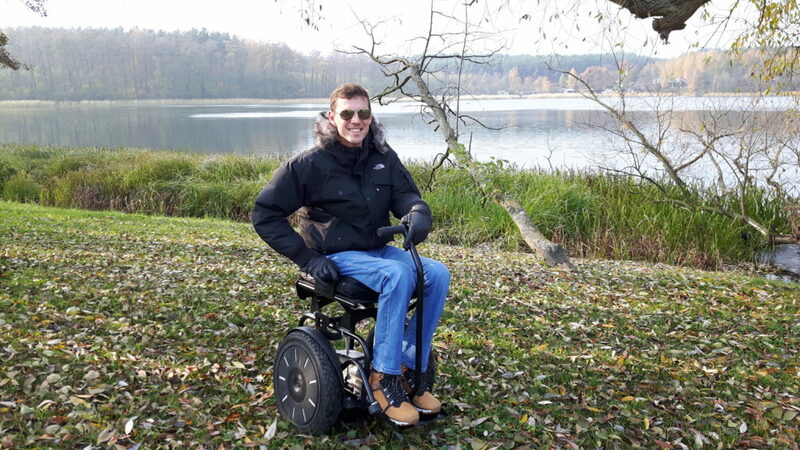 Going off the beaten track was impossible: both my old manual and electric wheelchair wasn’t cut out for country adventures. While my friends were off to enjoy the nature, I would be looking at everything through a window. Luckily, everything changed once I got my Blumil electric wheelchair. You see, unlike regular wheelchairs, Blumil’s very light and it’s easy to navigate it – even when the terrain’s challenging. That’s what freedom feels like – I can go anywhere and do about anything. Most of the times my friends are the ones who need to catch up with me – my Blumil’s faster than you would think. Doesn’t it sound perfect for countryside trips? I thought it did so I packed my bags and headed to “Herbarium”. What’s that? 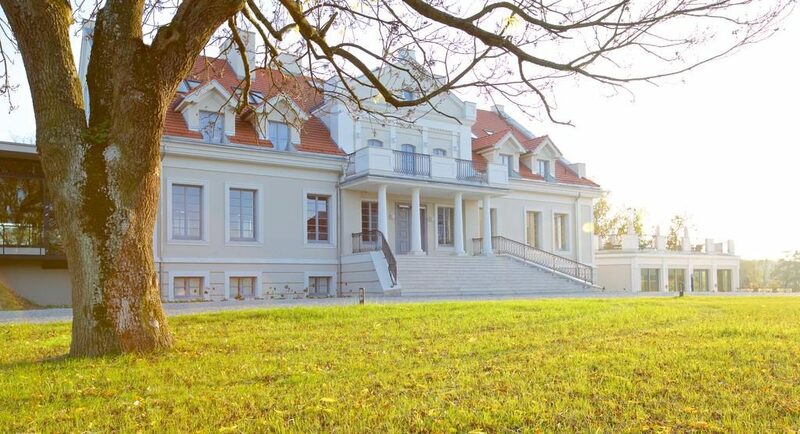 It’s a hotel and spa centre located in Chomiąża Szlachecka, Poland. Not too close, yet not too far away from Warsaw where I love, it made a perfect weekend getaway destination. Let’s put it under the microscope! Let’s imagine a scene: you’re by the lake and if you stroll around a little bit, a wonderful park from the XIX century will be right before your eyes. Sounds lovely, right? That’s what the hotel “Herbarium” offers! It used to be a manor house and it combines old-fashioned influences with modernity. Herbs are widely present in the hotel’s garden and the herbal smell is omnipresent everywhere in the complex. At first glance, it seems to be anything but accessible. Historic buildings and accessibility don’t often go together, but “Herbarium” is an exception to the rule. It managed to keep its old-time vibe without running away from the future, and now that’s something to be proud of. The hotel complex also includes the spa, so it’s truly a great place for both the body and the mind. It’s so easy to get lost in the world, which is constantly rushing towards the future. Between phone calls, meetings and daily routine we’re more than prone for a burnout. That’s why from time to time I like to take a step back and let myself enjoy the moment. Reconnecting with yourself and nature’s important so Herbarium served its purpose well. 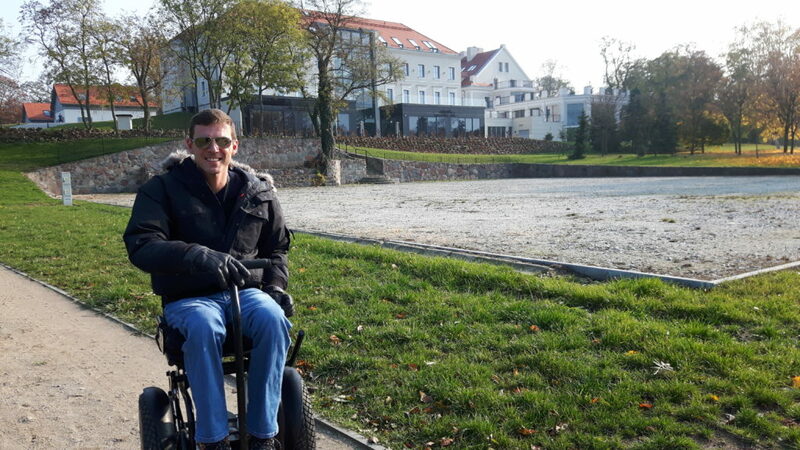 I was strolling on my Blumil electric wheelchair around the enormous park, enjoying the lovely weather and breathing in fresh air and I felt stress suddenly leaving my body. It’s magical how nature can calm our nerves down and recharge our batteries. Coco, my dog assistant, was there with me and I think she loved the place as much as I did. Open spaces full of greenness have something soothing about them. I was playing with Coco a lot and we both had lots of fun. 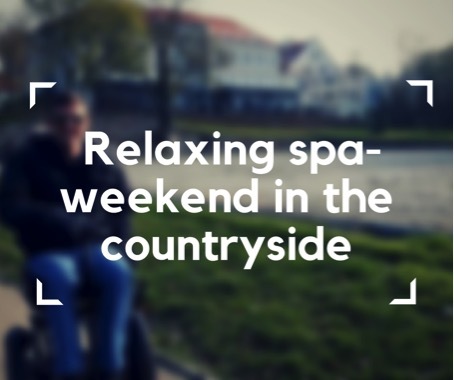 A big yes for countryside weekend getaways! The Chomiąskie lake is absolutely lovely and combined with the green spaces around it, it makes a wonderful view. I spent a lot of time enjoying the quiet beauty of everything I had in front of my eyes. Definitely, something I would recommend! Who doesn’t love a good spa treatment? The hotel “Herbarium” is also a spa centre, so I didn’t turn down the chance to treat my body with a spa day. The main theme of the complex are herbs, so the herbal smell is everywhere. There’s a pool inside and it gives a great view of the lake so you can enjoy the nature even when you’re not outside. 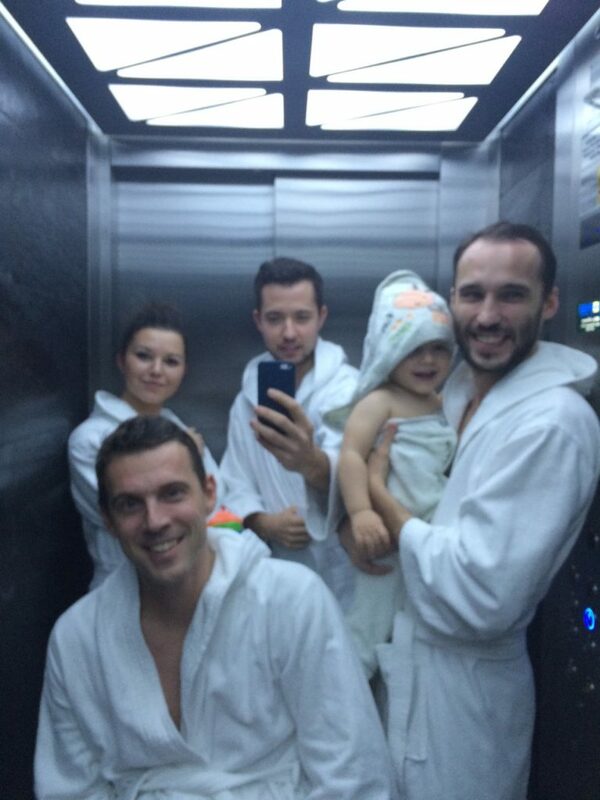 Steam sauna, Finnish sauna and jacuzzi are all available too, along with numerous beauty and wellness treatments. Honestly speaking, after such a relaxing weekend I felt like a brand new person and I’m not exaggerating. From time to time, such weekend getaways are all you need to get inspired and glowing again. Pavements are sadly far from perfect. Bumpy and uneven, they’re not easy to stroll around. 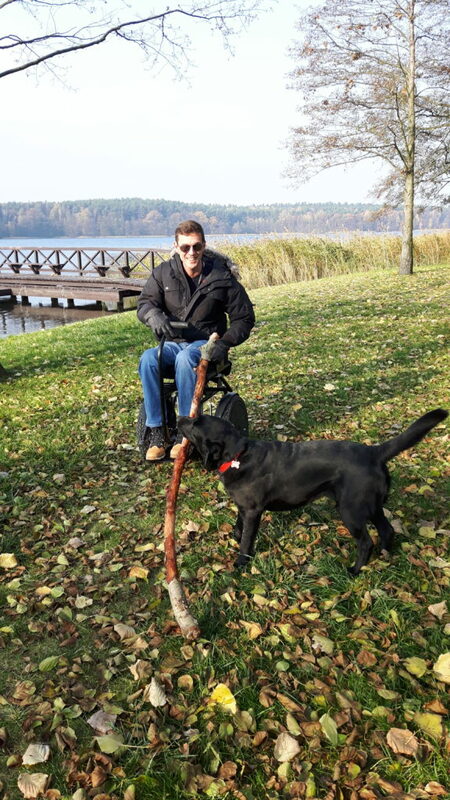 Luckily my Blumil doesn’t shy away from such challenges and keeps going forward almost effortlessly, but regular wheelchairs wouldn’t probably do well there. See for yourself in a video below! I’m racing with Coco… Who won? I don’t remember! 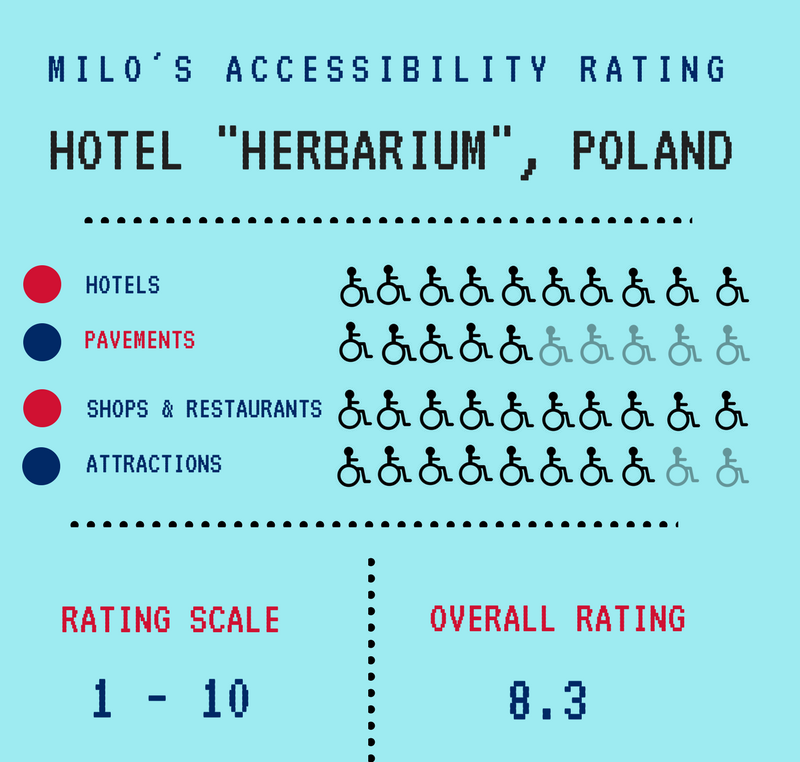 Just like the hotel itself, shops and restaurants are perfectly accessible. There wasn’t any place I could not access. Elevators and ramps were luckily a standard. Aside from nature, there’s not much to see in Herbarium. In general, we can enjoy the old architecture and it’s mostly accessible, though things could be a little better. Still, considering the age of the buildings the situation’s great. All in all, Herbarium is a wonderful weekend getaway destination. You can easily connect with nature there and sometimes that’s more than enough. I know it was everything I needed to feel refreshed and I would sincerely recommend you such refreshing trips. Countryside trips are definitely something to try!